A while ago, Forge World released their take on the Deimos Pattern Predators. Basically a remake using the old-school bubble turret Predators used to have. When they released their new version this past week, I'd had enough. The first time I saw one, I thought there had to be a way to make my own version of the same thing. 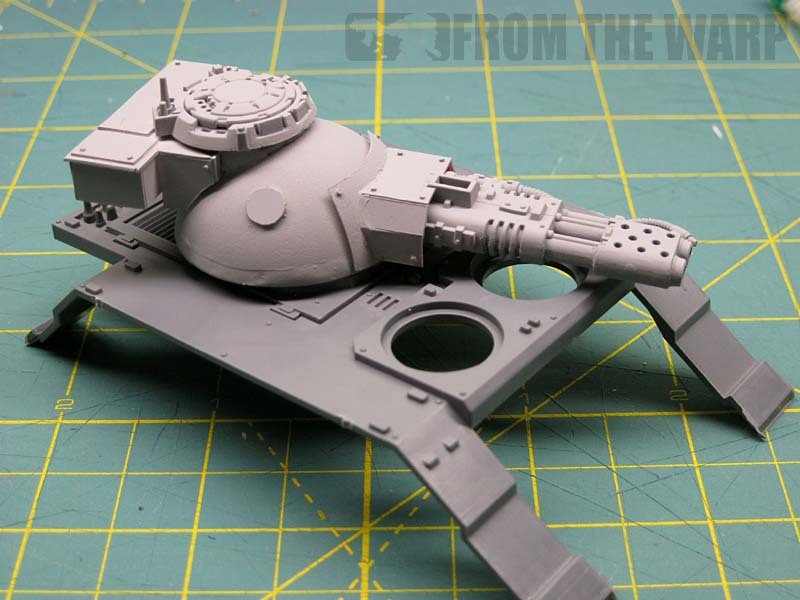 An interchangeable turret that could be set down on top of a normal Predator chassis to give it that "old school" bubble look. Something you could build and retrofit an existing model with to give you that older model look. When I sat down to build my experimental turret, the first thing I thought I could use was half of a ping-pong ball. I wasn't sure of the size, but I thought it would work. So I bought a small box of them for just over a dollar. If it didn't work out, it wouldn't be that big of a loss. Turns out, they are a shade too small to work really well. Can it be done? Sure, but it looks a bit off overall in the scale department. That could be my plasticard skills, but if I could find something just a tiny bit larger, I think I'd really be onto something. Let me start by saying I don't have any templates for this conversion. To be honest, I wasn't sure I was going to be able to pull it off. I went for broke and figured I'd do the best I could and then post what I came up with. I started by cutting the ping pong ball in half. From there, I trimmed a little more off so it was slightly less than half of the ball. I took that piece and glued it on top of a 40mm base. I ended up greenstuffing the small offset gap all the way around the bottom. From there, I built and added my gun and turret hatch. Both are cobbled together out of bits and plasticard. Since I couldn't find any suitable bits for the turret housing, I made it from plasticard. What a production that was. I don't do much plasticard work and this was a real challenge for me. It's lacking in a lot of ways, but someone with some real plasticard skills would have no trouble putting something like this together. I have to say, despite my poor plasticard skills, it was a huge blast to actually make my own piece the way I wanted. Talk about liberating. You can just build exactly what you want without having to try and make something that's kinda close work in its place. I can see how this addictive. It looks a little better once primed, but you can see all of the surface imperfections now. All in all, I'm going to call this one a win. As far as being proof that it can be done, someone with some skill should have no trouble at all making a couple of these for their army. And it sits right on top of a regular Predator chassis without any conversion work required. Working with plasticard is both a science and an art. I think I need to pick something easier next time to try and build. This might have been a bit out of my league in terms of complexity. Nonetheless, it was a huge leap forward for me in terms of working with plasticard and building my skills. Anyone need a spare Predator turret? UPDATE: Here's what she looks like primed. Like I said, you can really see the minor surface imperfections. I think as my skills improve, I will get better at minimizing them and reducing the amount of cleanup work I have to do. I think priming it puts it in a different light and it's a little easier to see it for the overall shape instead of the parts. The scale doesn't look so bad now. Still, if I could find something slightly larger, I think I'd be set. And... I'm working on a side sponson now! I think it turned out quite well! I do not think the scale is all that off. 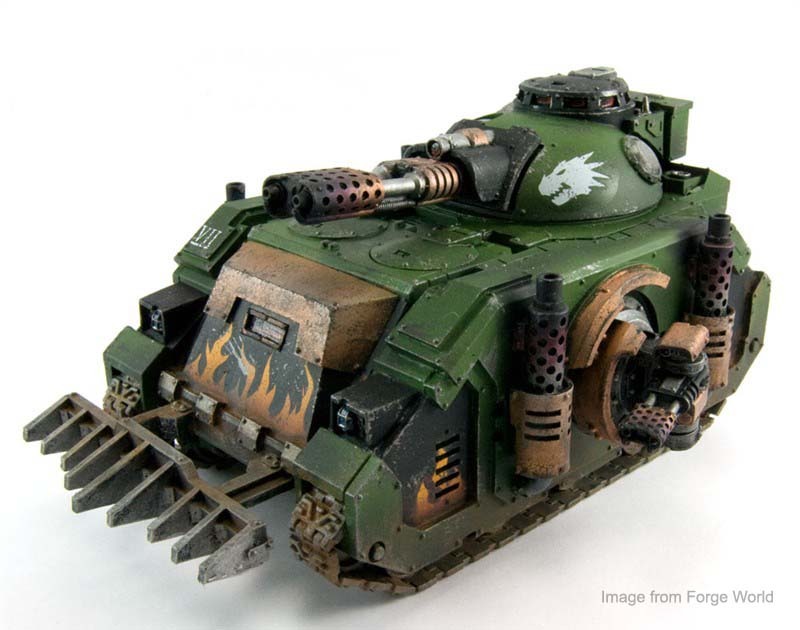 I really like the use of the plastic bases as spacers, reminds me of the early Baneblade plans from GW were they used plastic bases for a bunch of things. Thanks for sharing this! Keep up the great work! While not a fan of the Deimos Pattern myself, it's very nicely done. I do like the gun cowling on your version of it. Gonna try matching sponsons next? That's great Ron! 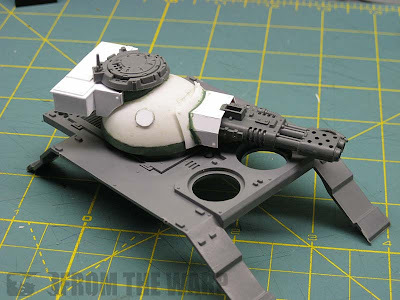 I think my dark angels will adopt this Ron Pattern Turret soon. oniakki: Hadn't thought about the sponsons to be honest. I wasn't sure I could do the turret first. vandalworks: I have a few pics of it primed. I can add those to the post. I think it looks better primed, but like I said, it shows you where all the problem areas are that would need to be fixed. That looks brilliant! I've never thought of using bases in this way. I bought some plasticard myself recently so I should really think about experimenting with it's uses. These are my favorite kinds of FTW posts, Ron. Looking forward to seeing it all painted up. A17roolz: Brilliant is not the first word that comes to mind, but thanks. I think if I were to do it again, it would be a bit more refined since I learned a number of lessons the first time around. Mr.Esty; Thank you Sir. I think I may stick to easier things in the future though. Trying to do plasticard work over a half sphere is quite tricky come to find out. Very, very nice and easy way to create old-school predator. May be you have some idea how can we made the sponsons in that style? Corvinus: Thanks. As for the side sponsons, I don't know. Since two of you guys have asked about it, I'll see what I can come up with that can be retrofitted into a regular Rhino chassis. Might take me a few days though. I do laugh at the fact i am now being asked to pay £80 to make a £28 tank look like a tank i used to be able to get 2 of for about £15 hehe. Nostalgia, a good licence to print money. Liking the plasticard adventure, i use it now and then but my modding skills are getting more use as my skills catch up to my ideas in my head! Oh it's Richard Rose, finally got a blogger\google thing sorted out. Will: Nope... can't see it so I'm not going to worry about it. Actually excited that I don't have to put a bottom on there. Zab: I know, I keep taking small steps towards it. Rick_1138: Same for me! I have all kinds of cool ideas, but my skills haven't quite caught up with them yet. Hudson: Thanks. I'm getting better. It's part science and part art. It's something you have to do often to get good at it. I definitely appreciate plasticard work much more now after trying a few small things like this. Looks great! While I'm not old-school enough to have the nostalgia going, I can appreciate the turret just for the variety it brings. You did some excellent work replicating the original! Looking forward to those side sponsons. And did I read "spare Predator turret"..? hey dont know if im actually gunna help or if you alredy got the sposons finished or not oh and it looks great aswell! what you could do for the little dome thing behind the flamer is cut one of the ping-pong balls in half then remove the top of it if you get me? like cut it half like you did then sit the flat side down and cut most of the top off and stick that to the side. 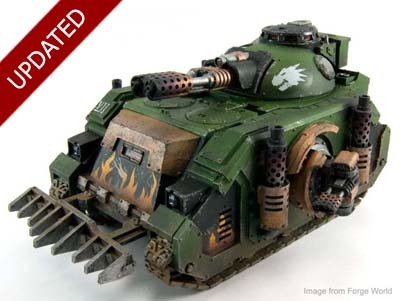 then you could get a baal predator and use the flamers form that? Green Stuff Industries: Thanks. It was a real learning experience. Ben: What? Get that thing put together already! Matt: The side sponsons are not coming out as well as the turret I'm afraid. They lack the bulk the FW version has. If all goes well, I should have my results in the next week. adam: The weapon mount is the hardest part. Rebuilding the side of the Predator was easy enough to do. Getting the armour plates the correct thickness and building the weapon arm have proven to be much harder than I thought. so you used a ping pong ball eh?? 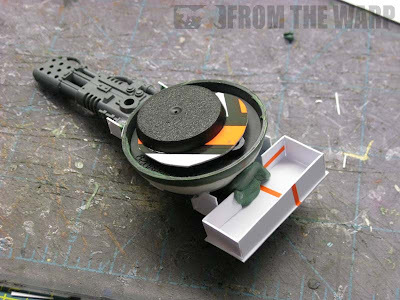 i used a polystyrene egg for my oldschool turret as they were egg shaped rather than plain round, in the good old days. sponsons should be a breeze, just measure the plates on flat plasticard, and heat and bend round an aerosol can (womans deoderant is about the right size) with a hair dryer/heat gun. actually that idea is pretty much how you do your cataphractii pads. This is what 'the real thing' should have looked like. The size of your ration box on the back of the turret is just right- it's the GW part that's off. AWESOME. Just a thought as to a source for the dome on your next try. Ball pit balls ... They are made of plastic, sphericle and a larger diameter. Might be worth a look see. cpt codpiece: I didn't think about heating the plastic to get it to bend easier. That's a good idea. Joester the toaster: Thanks for the link. That would be a perfect bit it looks like. Certainly much easier than trying to build one. Joe Gekko: Thanks. I made it larger since it looked a little better to me. It was all done spur of the moment and I wasn't using any reference other than what "looked good." Adam Catt: Interesting... good idea. I wonder how hard it would be to get a hold of one of those. Looks great, tempted to try this myself for my Annihilators. Joester the toaster: Those are nice conversions. I think I have some of the treads he sells. Dangermouse425: I think if I had to make more than one, I might try casting the turret itself. I don't know how your casting skills are, but building more than two of them might make it worth it.